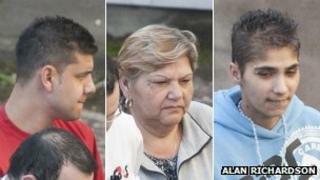 Three Slovakian nationals have been jailed for trafficking two people from their own country into Scotland. Helena Kulova, 47, Renata Kulova, 20, and Ivan Balog, 27, were convicted last month under the Asylum and Immigration Act 2004. Dundee Sheriff Court was told the victims were moved in Slovakia, and between Glasgow and Perth, with the intention of exploiting them. Sheriff Elizabeth Munro sentenced the trio to three years in prison each. The court had heard how they exploited a vulnerable Slovakian boyfriend and girlfriend, aged 24 and 19. They had tried to use the girl as the bride in a sham marriage in an attempt to secure UK status for another foreign national. Both she and her boyfriend had their personal documents taken from them, leaving them feeling trapped and isolated. Procurator fiscal Andrew McIntyre said justice had been delivered. "This conviction has shown that human trafficking takes many guises and does not always involve violence or physical force," he said. "The Kulovas and Ivan Balog exploited their victim by keeping her identification documents and deceiving her, thereby exerting control over her for their own ends." He said the case had involved authorities in several jurisdictions working together to prosecute the traffickers. "In this case we worked closely with the Scottish police and international authorities to allow the Scottish jury to hear vital evidence from Slovakian police and the victim's family, via a live TV link from Slovakia. "I hope, therefore, that this case makes clear the determination of Scottish prosecutors to tackle all forms of human trafficking and to use all powers available to us to bring the perpetrators of such crimes to justice." Tayside Police welcomed the sentence from the court and said it made clear the "wicked crime of human trafficking would not be tolerated". Ch Supt Gavin Robertson, who heads the Tayside Police Crime and Intelligence Division, said: ''We are all determined to shine a light on the malevolent and wholly abhorrent crime of human trafficking.